ooking back on my first Olympiad, it was by all counts a very positive experience. I got to reunite with a few chess friends, see players whom I have covered for the past four years and interact with some of the top chess personalities in the world. On the other hand, the images of the Olympiad are etched in my mind, yet are fleeting… and I realize that I will never be able to relive these images. However, at this time, my memories are clear… the faces, the buzz, the languages, the scenery, the cab rides, the laughter… and the smiles!! Memories are all we have and the only way to immortalize them is in writing. This is what I will do here. When setting foot in a foreign country, there are a couple of things that are immediately striking. The first thing is the staccato of the languages spoken. This is perhaps the most obvious sign that you are not at home and have to make a mental transition. 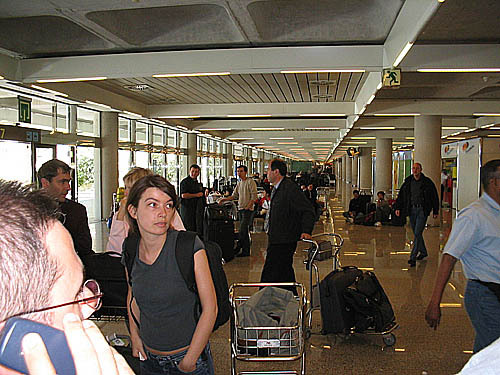 When arriving in Madrid, there was an American couple who kept complaining about everything. Granted the Madrid airport leaves a lot to be desired in terms of design and ease of navigation, but this couple mentioned more than once that "nobody spoke English!" I tried to stay as far away from them as possible. This is the "Ugly American" syndrome that I teach my students about. Thousands of players traveled through this gate at the Madrid airport to fly to Mallorca… including Vassily Ivanchuk (left). I arrived at Mirlos Tordos hotel on Wednesday afternoon and immediately checked into my modest room, showered and headed out to the Calvià Casino. However, I needed my accreditation which was neither at my hotel nor at the main playing site. It was at another hotel. When I got to that hotel they didn't have mine prepared, nor did they have any strings left, so I had to carry the badge around in my pocket. This was a bad omen. Whenever an organization misses small details, trouble is looming. Nevertheless, I eventually got to the Casino and would get my first taste of the Olympiad experience. After going through the security gate, the first view I got was the bustling traffic in the lobby area. The buzzing of anticipation was in full swing as the 12th round that had already begun. Of course, being a day behind is no fun at all, so I found the press room and quickly marked my turf… this would become my domain for the next four days. After setting up my station and churning out two hours of work, I ventured outside into the packed lobby. I saw Dr. Philip Corbin of Barbados at one of the book vendors and it would be my first time meeting the man known as the "Caribbean Tal." If you've seen his games, you understand why! Dr. Corbin has a pleasant demeanor and after exchanging pleasantries he tried to get me into the men's playing area to see the Barbados team, but it was already pass time for journalists and security was unyielding. We then went into the women's area which was not secured. Outside the women's playing area, I saw Malaku Lorne of Jamaica and told him to tell Ian Wilkinson I was here. I was able to get a glimpse of the women's games in progress, but the rest of the day was spent playing catch-up on rounds 11 and 12. 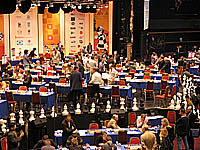 The press room was bustling with activity including famous players who'd come in and out to give interviews, visit officials and speak with Frederic Friedel of ChessBase.com. His team sat across from me and spoke German most of the time. The first day was a grind, but it ended on a pleasant note because I met Viswanathan Anand who is as ever bit as pleasant as his billing. In the next couple of days I would seek out a number of players from the African and Caribbean countries. I even got to exchange the few words I know of Papiamento with Louis Smith of Curaçao. One of my best friends is from Aruba where they also speak this Dutch Creole. Language is an interesting phenomenon! Within the Olympiad venue, hundreds of languages were being spoken at once and most of the people I encountered were at least bilingual. It was interesting to see Anand give an interview in Spanish! I attended a couple of the General Assembly sessions and learned first-hand that FIDE politics are like no other. 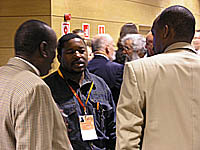 Before walking in, Nizar ElHaj, FIDE's continental President for Africa was complaining that no placards had been made for the African countries. The African delegates were seated in the back of the room… it was a gross oversight and ElHaj was fuming. I also realized that while African nations were active in the discussions, they were still marginalized. This has to change. I met many African and Caribbean officials all of whom were cheerful and optimistic. This was the first time that I had made contact with many federations and some had changed leadership since my last contact. From one official, I found out that a Botswana youth coach (named Oscar Mayisela) had passed away a few years back. I met Oscar 20 years ago at the 1983 World Youth Team Championship in Chicago. We kept in touch by exchanging letters over the years, but we would never meet again. 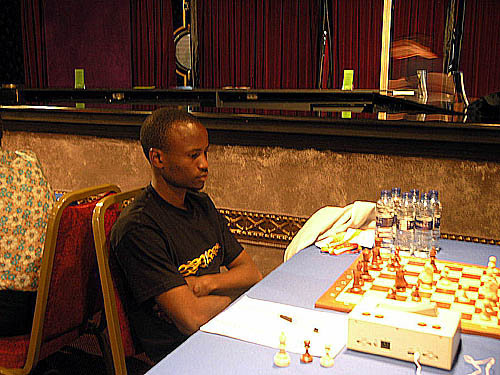 Ironically, Botswana player Ignatius Njobvu asked me, "When are you coming to visit our country?" I have a number of memories from Mallorca, Spain. Some of are trivial such as the electricity conservation setup in Spanish hotels that requires you to insert your hotel key in a slot to get power. Others are indelible such as the electric scene of players gripped in mental combat. Of course, there were other instances that left less of an impression, but are no less important in fashioning my overall experience. Before embarking on my trip, Zambian ace Amon Simutowe thought it would be a great trip for me. He was right, but in moment of reflection, I blurted out to Frederic Friedel, "You know… it's much easier to cover events from home than in person." "Certainly!" he replied without hesitating. I never caught up with my reports and three weeks after the conclusion of the 36th Olympiad, I'm still writing about my reflections! 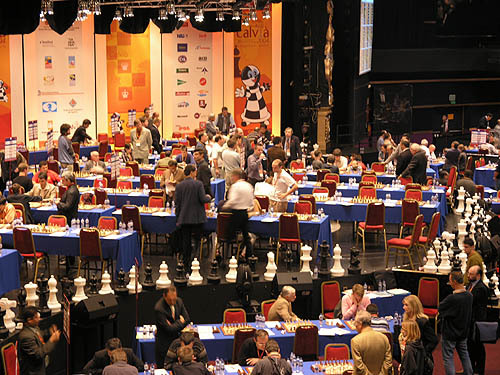 For the four days in Mallorca, I was part of an international outpouring of affection for the game called chess. In another moment of reflection, I thought to myself… how is it that so many people from all over the world can be so passionate about chess? There is a certain absurdity to this thought, but when looking around the press room, observing the fervor of the journalists and listening to the clicking of the keyboards, I knew why. I had learned so much from observing the dedication of both the journalists and players. The thought that so many people had traveled so many miles to participate in this event was testament to the powerful magnetism of chess. Perhaps it is this power that provided us with the most pleasant (and horrible) memories in Mallorca… many which I shall never forget. conversations about "Chess and Education" with Sunil Weeramantry on the trip back to the U.S.
not having played one game of chess while in Mallorca!